Captain Jack Sparrow has been gone an awful long time – six years, to be exact, but Johnny Depp’s inimitable hero will be back on deck later this year thanks to the release of Pirates Of The Caribbean: Dead Men Tell No Tales. Fittingly, Joachim Rønning and Espen Sandberg’s sequel, angled as the fifth installment in Disney’s tentpole franchise, opens at a time when Captain Jack has all but fallen off the radar, hunted to the point of no return by the villainous Salazar (Javier Bardem). Don’t worry though, Depp’s lead won’t spend the entirety of Dead Men Tell No Tales in exile, and previous teasers have hinted at the comeback story that fans have been longing for since 2011. Speaking of which, it looks as though the full-length trailer for Pirates of the Caribbean 5 is now ready to set sail. First reported by Trailer Track, Alberta Film Ratings has classified the third and fourth trailers for Rønning and Sandberg’s blockbuster, indicating that both should be online by the time Beauty and the Beast lights up theaters on March 17th. It should be noted that those two cuts actually represent the 2D and 3D versions of the sizzle reel, as opposed to two different trailers. What’s more, Bill Condon’s live-action fairytale will also herald the first look at Pixar animation Coco. 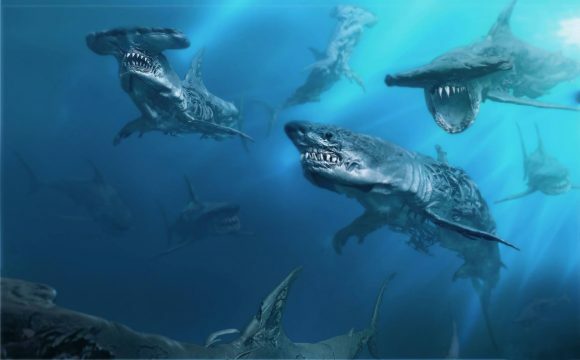 Circling back to Dead Men Tell No Tales, though, and AMC Theaters (via Coming Soon) has shared new concept art of the ghost sharks as they’ll appear in Disney’s tentpole sequel. The dead have taken command of the sea, it seems, and standing in their way are Johnny Depp as Captain Jack, Kevin R. McNally as Joshamee Gibbs, Golshifteh Farahani as the sea-witch Shansa, David Wenham as Scarfield, Stephen Graham as Scrum, and Geoffrey Rush as the irreverent Captain Hector Barbossa. Pirates Of The Caribbean: Dead Men Tell No Tales has its sights trained on a May 26th release date, which is smack bang in the middle of Alien: Covenant and the Dwayne Johnson-led Baywatch reboot. But the bigger question for Disney is whether Captain Jack Sparrow still has the same box office draw after all these years on the high seas. We’ll find out in a few months’ time.